snowdeal.org > ex machina: the eric update - day 1003: is there a wear-my-favorite-things-everyday phase? the eric update - day 1003: is there a wear-my-favorite-things-everyday phase? i think it started in earnest with his new knit cap which he's worn all day every day and most nights for 16 days in a row. and then he wanted to wear his size 10 boots every. single. day. and the orange fleece? you guessed it. every day. 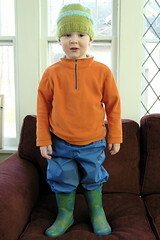 thankfully, the rain pants haven't been received the same attention. although it probably wouldn't be the worst thing in the world given the spring thaw making it mighty muddy 'round here. i'd like to think it's just a phase, but then again, now that i think about it, i do the same thing. perhaps it's time for a fatherly lesson in the fine art of wearing the same thing all the time without appearing as if you're doing just that. maybe it's a "guy thing". seriously!!! Could this kid BE any cuter???? Oh yeah, and why doesn't Kris ever read my emails!